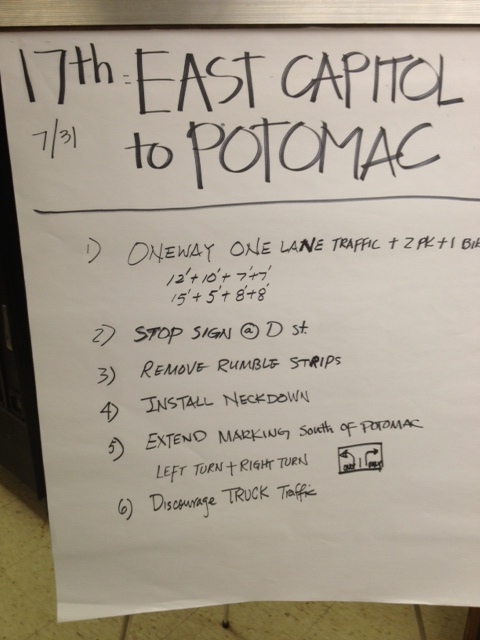 Recommendations from the 17th Street SE table at the July 31 charrette meeting. Last night, DDOT wrapped up the public charrette portion of the 17th & 19th Streets Safety Improvement Project with a second meeting at Pilgrim AME Church in Rosedale. Aroun d 30-40 attendees again divided up into six groups to examine various portions of the 17th and 19th Street corridors. Given the location, the 17th and 19th Street NE tables had significantly larger groups than the SE tables. Not a whole lot of new information to add from the Meeting #1 recap. Once again, I participated in the 17th Street SE group along with two other residents and a McKissack & McKissack consultant. Our table agreed with the Monday group’s recommendation to maintain 17th Street SE as a one way street but reduce it to one lane with a bike lane and on-street parking on both sides of the street. We also suggested installing bulbouts or neckdowns at each intersection between East Capitol Street SE and Barney Circle SE, which would narrow the road and shorten the pedestrian crossings. A four-way stop should be installed at 17th Street SE and D Street SE, an intersection that is about half way in between the signals at Mass Ave. SE and Potomac Ave. SE. Get rid of the current rumble strips. They are ineffective and create more noise. Discourage or restrict truck traffic on 17th. Group supported placing a temporary sign on I-295 near East Capitol exit advising motorists that 11th Street bridge ramp is now open. Better signage and street marking needed along the entire corridor. DDOT and McKissack and McKissack plan to release their final recommendations/plans for 17th & 19th Streets during a mid-September meeting. I’ll post the meeting date/time/location once it is announced. Please post any comments/suggestions below. This entry was posted on Wednesday, August 1st, 2012 at 2:09 pm and is filed under Uncategorized. You can follow any responses to this entry through the RSS 2.0 feed. You can leave a response, or trackback from your own site.